Hard working Store Associate who drives high sales in both slow and busy shifts. 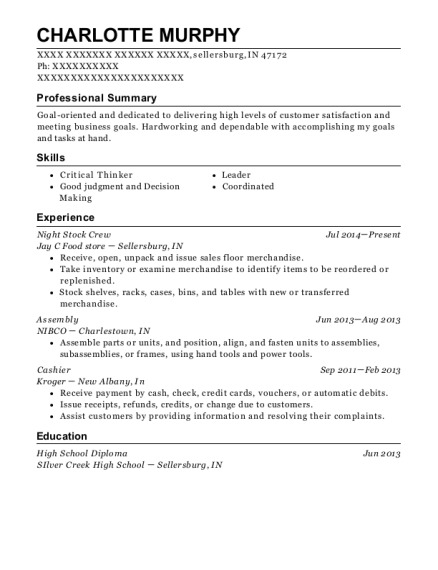 Personable and hard working with background in stock and inventory. Maintains an orderly and neat store floor at all times. Night Stock, Feb 2015－Feb 2015 Acme Markets, Bensalem, PA Responsible for stocking shelves, assisting customers on floor, maintaining stock throughout the store. Carpet and Tile Cleaner, Feb 2012－Jan 2014 Wayne Carpet and Tile Cleaning, Langhorne , PA Responsible for cleaning businesses after hours. Cleaned carpeting, tiles and windows. Bar Back and Cleaner, May 2011－Feb 2012 Trapeze Night Club, Philadelphia, PA Responsible for keeping the bar supplied with ice and beverages. Responsible for after hours cleaning of the club. Interacted with customers to make certain all of their needs were made for a positive experience while at the club. Bus Boy/Midnight Cleaner/Server Assistant, May 2009－Feb 2011 On The Border Restaurant, Neshaminy, PA Responsible for clearing tables as guests finished their meals. Assisted with delivering food to customer tables. Responsible for end of day cleaning f the restaurant to prepare for next day service. Store Clerk, Jun 2007－May 2008 Save-A-Lot Food Store, Philadelphia, PA Responsible for running the register, providing excellent customer service. Responsible for stocking shelves and maintaining a clean store. Worked in the produce department, rotating stock and making sure freshest produce was available to customers. 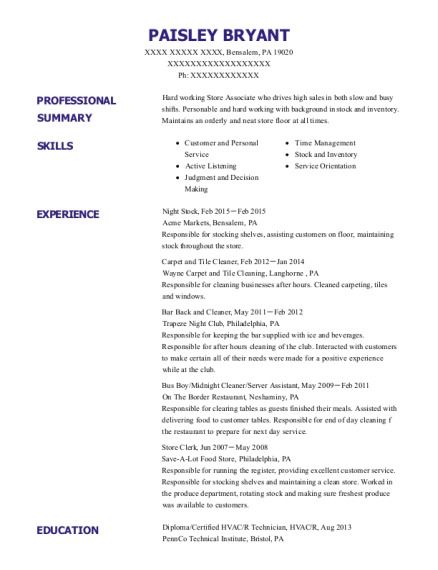 This is a resume for a Night Stock in Bensalem, Pennsylvania with experience working for such companies as Acme Markets and Wayne Carpet and Tile Cleaning. 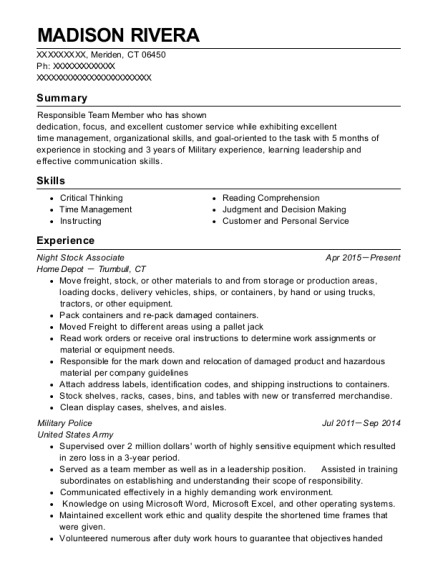 The grade for this resume is 0 and is one of hundreds of Night Stock resumes available on our site for free. 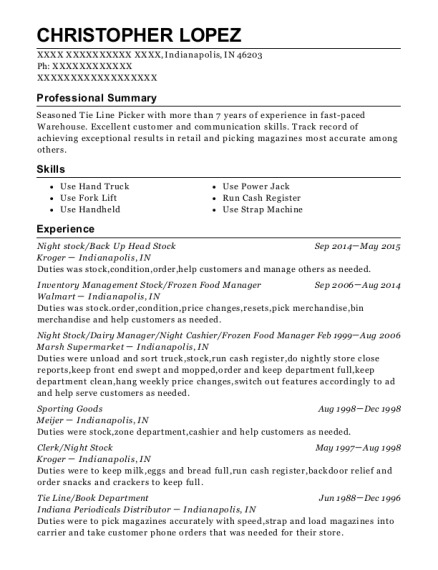 Use these resumes as templates to get help creating the best Night Stock resume.